I don’t often have a reason to bake a cake and even if I think, “well, I don’t need a reason!” baking a big cake for myself is just a bad idea. It means I will either eat the entire thing or end up throwing most of it away. Depending on the outcome, it’s either an exercise in excessiveness or wastefulness and so there hasn’t been a lot of homemade cakes in my life. And then I talked to my best friend who told me people use their microwaves to cook things. Not just to reheat leftovers, or nuke a frozen meal, but real cooking where you combine raw ingredients, toss them in the microwave, and, voila, dinner or dessert (or both!) is served. It was a revelation. Turns out, my microwave could deliver what I thought was out of reach: a single-serve mug cake that’s fast and easy. Plus, there’s no risk of a chocolate overdose followed by the day-after self-hate that goes with a regular-sized cake. The moderation is built right in. It really is as simple as combining a few ingredients in a mug and popping it in the microwave, but if you need a visual reference you must watch this Lucky Peach video. Not so much for the detailed steps, but more for the quirkiness of it that might make you smile. I adapted this same recipe here – I switched a few things up like cream for milk, butter for oil, and a nice dollop of ice cream to finish it off. Decadence, it seems, is the order of the day. 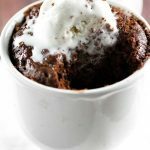 As the name of this recipe suggests, this single-serve cake is “baked” in a mug in the microwave meaning there are just five minutes between you and a big spoonful of this chocolaty rich dessert. Adapted from Lucky Peach, my version amps up the decadence with some butter, cream, and a generous dollop of vanilla bean ice cream to top it off. Combine the butter, egg, and cream together in a coffee mug until well combined. Add the flour and sugar and keep stirring. Add the cocoa, vanilla, and salt and stir until just combined. Stir in the chocolate chips. Place the mug in a microwave and cook for 2 minutes. Remove the mug from the microwave and let it sit for a few minutes to cool. Top the cake with the ice cream, grab a spoon, and dig in. It tastes good but the texture turned out weird? I might have done it wrong. 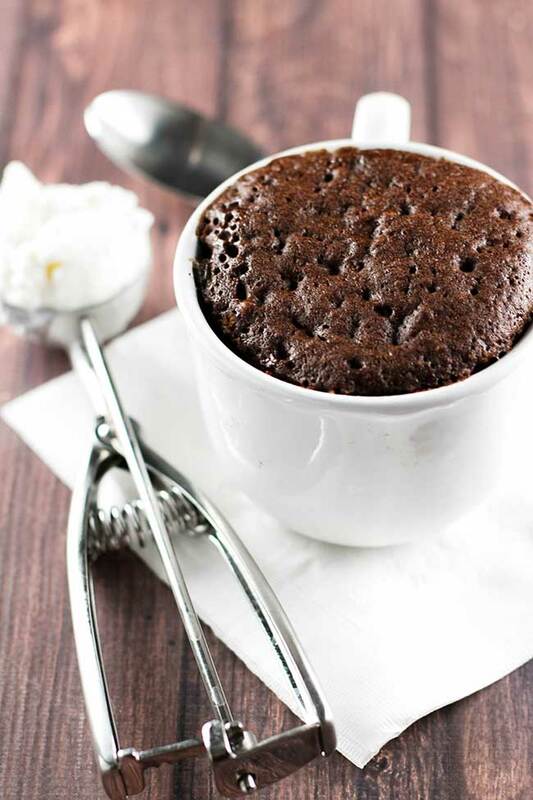 You advertised it as a “molten” chocolate mug cake. I thought it was going to be like a lava cake but mine turned out completely cooked through. The texture is also a little spongey. Did I do something wrong? It could be a difference with the microwave power – if it was too spongy it might have been cooked too long. You might want to try cooking it a little less next time! Is it really true that the cake has 933 calories?? Seems like a lot for a little cake? Hi Sarah – it’s actually a pretty big serving, almost enough to serve two people and it’s pretty decadent with all the butter, sugar, and cream. Hi Paige, I’m really sorry you didn’t enjoy it. That’s great! It really is the perfect easy sweet treat 🙂 So glad you guys liked it! Your blog is seriously after my own heart–sub cream for milk–genius! I look for ways to add butter too 🙂 The extra fat makes recipes taste better, and I am pretty well convinced it’s healthier too. Will try these mini cakes, and am about to make your peanut butter chocolate muffins later this afternoon. Thanks–I just subscribed! I had a major chocolate craving and found this on pinterest – LOVED IT!! This was so yummy! The first time I made it, I thought it was slightly too sweet, so I decided to add just a little less sugar. I have made it several times since and now it is my go-to recipe when I’m in an I-want-dessert-now mood. What a great idea! Found this on Pinterest and love it! About what size mug does this fill? A standard size? Or should I use a larger mug? Hi Hillary – a 10-12 ounce mug should work great. I added a bit of coconut oil to enhance the chocolate and it turned out quick, easy, and delicious! Definitely doing this again! Thanks! Can we use milk instead of heavy cream? You know I don’t think I’ve ever actually cooked something in my microwave! 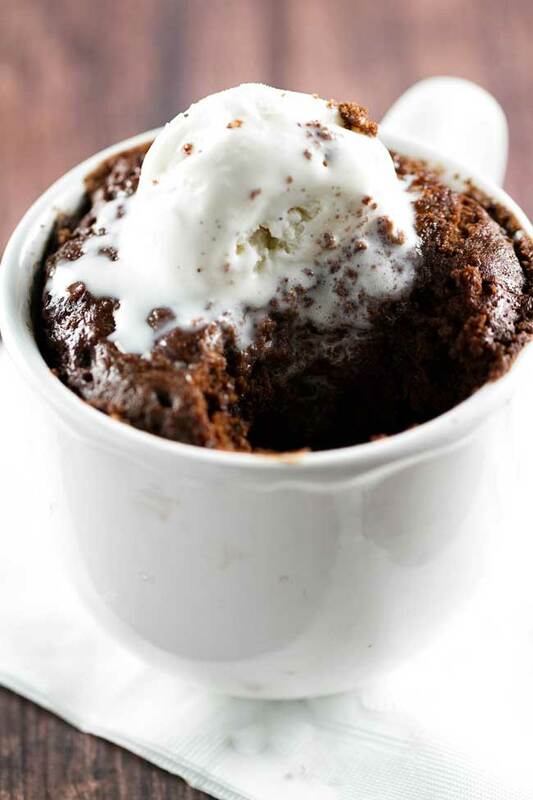 It’s time to remedy that…this mug cake looks like a delicious way to start!